Today we’re talking about our Month of Coordination Package. 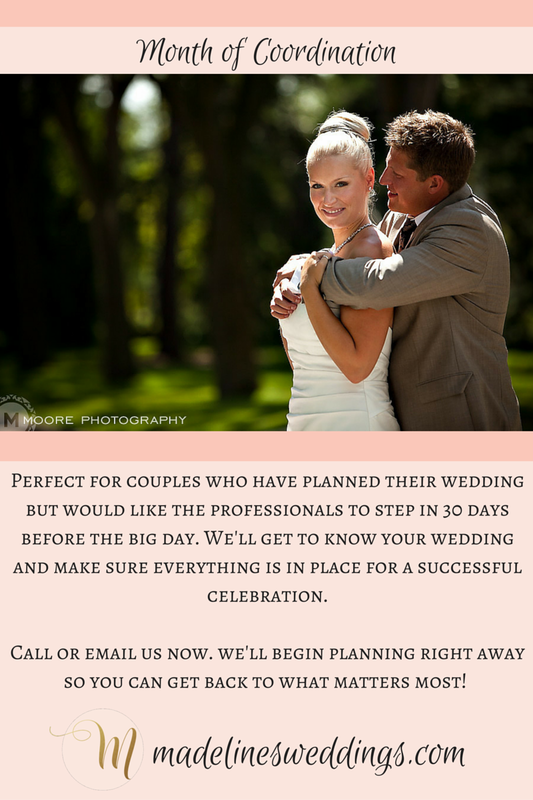 Perfect for couples who have planned their wedding but would like the professionals to step in 30 days before the big day. We’ll get to know your wedding and make sure everything is in place for a successful celebration. What is this exactly and how does it differ from Wedding Day Coordination? Our Month of Coordination Package is designed to let you and your fiance enjoy the last bit of your engagement. We don’t want you pulling your hair out the month before the wedding. We know it can be a very busy and stressful time and we’d like to help. – Make sure all vendors have been secured. If there are a couple vendors missing from your list, we will source them out and get them booked for your day. – Create and provide a complete wedding day timeline. We will hand this out to all of your vendors to ensure everyone is on the same page.